After reporting on the potential hazards of ingenuity since 1990, the progress trap project began focusing on solutions. Solar energy was an obvious topic, as was wind energy. A seemingly obvious question came up - has anyone combined these two? - indeed they have, as hybrid home installations, but not much on a small portable scale. So we set about designing a concept, calling it the Personal Renewable Energy Module", and it received design patent registration with surprisingly little fuss. Encouraged by this, some fundraising followed and with a Catalyst grant from the RSA (UK), work on the prototype began. The RSA has also provided mentoring for a possible Kickstarter campaign, in which RSA projects have an 80% success rate. The solar aspect was relatively easy as those components are well established and efficient. Wind energy on a small scale is a major challenge. That meant experimenting with light materials and low wind speeds that typify the experience in urban or rural areas where a manually portable device would be useful. It also meant designing a vertical rotor blade and mechanism that would maximally exploit low wind pressure, while mitigating rotation resistance. The patent on that 'invention' is pending. Several motors were tested, including axial and radial-flux models. With the expert help of Dr. Waqas Khan, an attractive virtual prototype was engineered in 3D CAD. 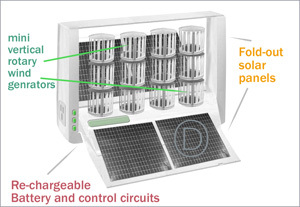 It includes technical details and exact specifications for 3D printing, rechargeable battery, charge controller, solar panels, and status monitoring. with its appealing design help create a positive context for environmental awareness and action. 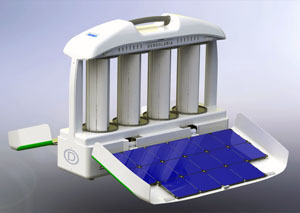 form micro-grids when several units are connected together. The start-up project's site is gensolaria.com, where any any comments, inquiries or orders for the (future) product will be welcome.